Depression and anxiety can cripple you, making it impossible for you to function well from one day to the next. These states are not reserved for people who have deep rooted psychological problems. They can affect anyone at any time. When life events become challenging, and one does not have the right tools at their disposal to cope, it is possible to become depressed. Depression and anxiety lead to negative thinking, which has the ability to bring you down and make you feel as though you are powerless. You may then choose to isolate yourself from others and thus experience even more anguish. The good news is this can easily be overcome, without any drastic or dangerous steps. All it takes is knowing which part of your emotional state you should focus on for improvement. 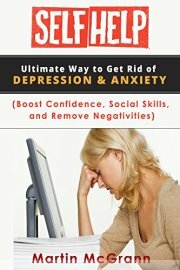 This book will teach you about your confidence, and how boosting your confidence can help you to fight depression and anxiety. You will also learn about your social skills and the importance of being able to interact with other people. Doing this will help to add interesting elements in your life, in the form of people, conversations and experiences. In addition, you will learn about the power of postiiveity, and how the right frame of mind is all that you need to powerfully overcome depression and anxiety. There is no need for you to suffer anymore, and to feel downhearted. You can be the one in the driver’s seat of your life, by using the tips in this book as the ultimate tool to overcome depression and anxiety.